I love chai! In America, chai means a black tea with five or more Indian spices added. My favorite chai blend is equal parts of cardamom, cinnamon, cloves, ginger, and black pepper. In this recipe, however, I’ve reduced the ginger and omitted the pepper in order to better suit young taste budes. And this is a great kids’ breakfast! 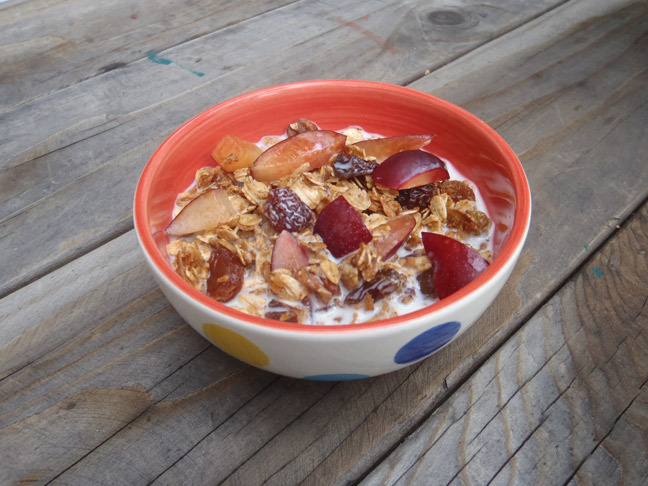 This unique granola, with its warming, soothing blend of spices, is a not only great in the morning with milk and fresh fruit, but also makes for a great on-the-go snack! Heat the oven to 375 degrees. In a small sauce pan over low heat, melt the butter with 3/4 cup honey and vanilla. Continue cooking on the lowest possible heat until the color becomes slightly darker, about four minutes. Set aside. In a small mixing bowl, combine the spices with the salt; mix to ensure they are well blended, and set aside. In a large mixing bowl, combine the oats with the coconut, pecans and spice blend. Pour in the honey mixture and combine, making sure the entire mixture is coated. Evenly distribute the mixture between two rimmed baking sheets. Melt the remaining four tablespoons of honey and evenly drizzle on top. Bake until golden brown and very aromatic, about fifteen minutes, gently mixing with a spatula halfway through. Cool to room temperature, pour back into the large mixing bowl, and stir in the raisins. Serve with milk and fresh fruit.